There is no other food quite as festive as caviar. Adored by Russian tsars, feudal lords, and lovers of fine food today, its combination of taste and texture is a unique food experience. The traditional way of serving fresh caviar is in its jar or tin nestled in a large shallow bowl of crushed ice with its lid along side. Ideally, it should be served with a mother-of-pearl spoon, but some serve it on gold plated dishes or on fine porcelain with ivory or antler spoon. Caviar is never served in silver, because it imparts a metallic taste and the caviar will discolor the silver. Caviar should be served as simply as possible and it is only accompanied by fresh toast points, potatoes or perhaps a touch of cr?me fraîche. 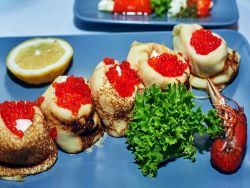 Anything more would mask the intense and bewitching experience of eating caviar, although Russians love eating caviar in their blinis, along with chopped egg and green onion. Besides disputes over how to serve caviar, there is plenty of debate over what to drink with it. 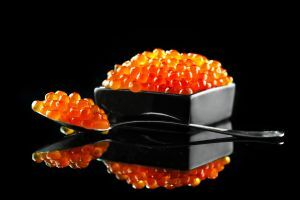 Caviar's traditional partners are iced vodka, champagne or black tea. 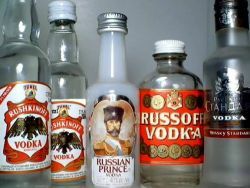 While "caviar and champagne" sounds better, purists believe that vodka, not champagne should be the drink of choice. Vodka and caviar are the perfect complements for each other. Food mavens agree that the cool, fresh taste of vodka cuts the salt of the caviar and cleanses the palate.